I had the honour of attending the “12th International Conference on Materials Chemistry” (MC12) on behalf of the Photovoltaic Innovation Network (PVIN). 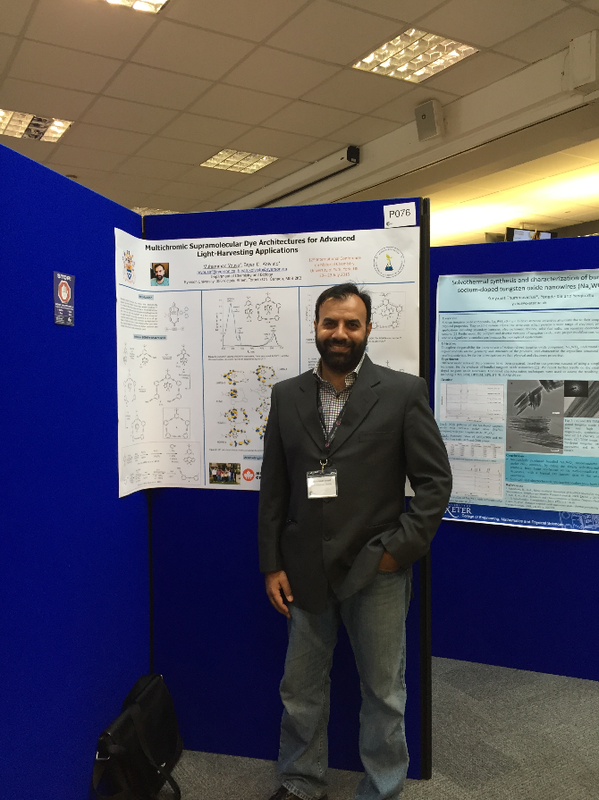 The conference was held by the Royal Society of Chemistry in York, UK, from July 20-23, 2015. This was the first time I attended a conference outside Canada and presented my research. Although I wasn’t able to submit an abstract due to late registration, management still allowed me to present a poster. The conference was held in the Exhibition Center and Central Hall located in the University of York, UK. The University is located in the center of the historical city of York. The lake in the middle of the departments gives the University a beautiful look. While talks were going on simultaneously in both the centers (Exhibition Center and Central Hall), which are on opposite sides of the lake and connected by a bridge, moving back and forth between the two centers was nothing less than fun. The conference started on Monday, July 20th. The talks were organized in parallel sessions under various divisions i.e. soft matter materials, electronic materials, biomaterials, energy materials and nanomaterials. There were a lot of interesting talks in each division but the most interesting to me were mostly in the energy materials division. Among the plethora of interesting research, the one that stood out to me in particular was about the charge/energy transfer at nanocarbon-metal oxide interfaces by Nina Kemnade from the University of Munster, Germany. According to this research, when sp2 hybridized nanocarbons are combined with metal oxides or other inorganic materials in a way that new surfaces are created, synergistic effects can occur. Therefore new material properties are provided by these “hybrid” materials and are interesting for many applications, e.g. photovoltaics, photocatalysis, batteries and chemical sensors. The efficiency of exciton separation via charge/energy transfer processes, through the nanocarbon-metal oxide interface, plays a key role for the improved performance especially for photochemical applications. One of the posters by Alexey Cherevan, from the Institute of Physical Chemistry and Graduate School of Chemistry, Munster, Germany, highlighted photocatalytic splitting of water. Photocatalytic water splitting is a promising method for H2 generation by means of accessible materials and available sunlight energy sources. The process has a strong potential to accelerate the impending transition to renewable energy sources and become an alternative to unsustainable H2 production methods. Among some of the interesting talks, the one which most captured my attention was by Dr. Pascal Schouwink from the University of Geneva, Genève. Dr. Schouwink’s talk was about the complex metal hydride perovskite material to be used in the photovoltaics. They observed the hydride anion H―, although hydrogen is rarely encountered in oxide perovskite lattices, substituting for the oxide anion in BaTiO3. They discovered the perovskite-type metal borohydride, KMn(BH4)3, during thermal decomposition of K2Mn(BH4)4. Metal borohydrides are usually obtained by synthesis approaches that are hard to control. The series of new compounds they reported adds numerous new properties to the vast family of existing perovskite materials. The chemistry of anion mixing is expanded by the highly dynamic complex BH4, which hosts a number of unique features. At the conference I presented a poster on my work involving supramolecular dye architectures for advanced light-harvesting and energy transfer applications. A lot of people showed interest in my metal-free organic dye design for Dye Sensitized Solar Cells (DSSCs). During the poster presentation, I got some good comments and suggestions about optimizing the macrocyclic part of the dye for panchromatic absorption. Overall, it was a great experience to meet researchers from all over the world. After sharing ideas with different researchers, I had a lot of inspiration and motivation. Also, I found some new directions for my research. Besides the conference, I also visited the historical city of York with some other conference attendees and was speechless by the architecture of the buildings and the way they have been maintained to give their original look. After the conference, I had a chance to visit the lab of Dr. Khaja Nazeeruddin in the Institute of Chemical Science and Engineering, Ecole Polytechnique Federale de Lausanne, CH-1015 Lausanne, Switzerland. His research mainly focuses on the perovskite photovoltaics which is directly related to our area of research. They are in the process of developing a new lab in Sion (a city at a distance of 90 km from Lausanne). It is a newly furnished and well equipped/designed lab for HQP. Although this tour was an introductory visit to his lab and research, it could lead to collaboration in the future.